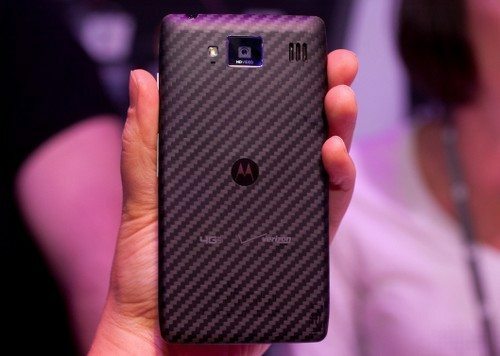 During the Motorola event in New York, the company unveiled the successors to the Motorola Droid RAZR and the Motorola Droid RAZR MAXX, in the form of the HD version of each device, which are the first smartphones to be unveiled by Motorola since being acquired by Google, and like the previous handsets these two new devices could be just as much a hit. The Motorola Droid RAZR MAXX HD looks fairly similar to the original smartphone, but is a tad thicker because of the battery, and just like the Motorola Droid RAZR HD the MAXX HD sports a bigger 4.7-inch AMOLED HD display yet has a smaller body than the HTC One X and Samsung Galaxy S3 reports Cnet. Both the Motorola Droid RAZR HD and Motorola Droid RAZR MAXX HD sport the same 1.5GHz Snapdragon S4 dual core processor along with 1GB RAM, whilst the RAZR HD has 16GB storage, and the RAZR MAXX HD double that to 32GB storage. Both devices run Android Ice Cream Sandwich, have an 8 megapixel camera with LED flash, 4G LTE capable, and microSD expansion. When it comes to the battery, the Droid RAZR HD sports a 2530mAh battery offering 16-hours of talk time along with 24-hours of ‘mixed use’, whilst the Droid RAZR MAXX HD again comes sporting a 3300mAh battery that offers 21-hours of talk time, 32-hours of ‘mixed use’, 10-hours of video streaming, or 27-hours of music streaming. The new Android smartphones will be updated to Android Jelly Bean by the end of the year, however Motorola hasn’t made any mention as to just when either of the HD handsets will become available other than sometime this year, and of course there’s no word on any pricing. For those Android faithful that might be interested in snapping up the Motorola Droid RAZR HD or Motorola Droid RAZR MAXX HD when they become available, we have a little first look video with each device for your viewing consideration below, so hit those play buttons to check them out. Are any of our readers impressed with the new HD versions of these two popular Motorola smartphones?